“All Hallows’ eve” isn’t exactly an easy film and will surely enchant few. It’s clearly a low-budget film with a somewhat sinister and absurd atmosphere, mixed with some gore scenes and an atmosphere that reminded me of 80s horror movies. That is the strongest and most positive point why I could actually appreciate this movie. That nostalgic feeling and mood in this “Halloween”-like film. It felt indeed like a rented VHS with a outdated movie. Including a bad image caused by age and noise on the videotape. You only needed the monotonous music of an old synthesizer and it would be a perfect imitation. It all starts on a Halloween night. Sarah (Katie Maguire) is babysitting that night and the two teenagers, Timmy and Tia, are back from a round of “Trick or Treat”. Just before they go to sleep, Timmy discovers a VHS tape between his candy. They convince Sarah to look what´s actually on it , assuming that it’s probably a scary Halloween movie. Eventually there appear to be three short horror films with “Art the Clown” as a central figure. “All Hallows’ eve” is a so called anthology film : a collection of different stories. The different stories are actually the downside of this movie. They are not very original and the first two are downright bad. The first story is pretty absurd and confusing. Besides a claustrophobic feeling and the intention to make a kind of demonic torture story out of it, it didn’t make a big resounding impression on me. A content-free and completely insignificant whole. The exhibit of gross footage didn’t make it any better. And it looked as if they were slicing and chopping marzipan. Not exactly a successful part of the movie. The clown appeared briefly as if it was just a prop. So this was just a warm-up. The second story had a completely different approach, but it was completely ruined by the design of the creature. It looked like the character on the painting “The Scream”, but with all kinds of attributes. Total nonsense, no suspense or fear moments. “Art” was not even there in person. Ultimately the story progresses as expected. The film has similarities with “V/H/S” and “Playback“. 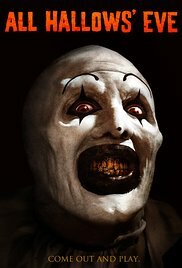 The whole movie revolves around Art and I must admit that this is a truly deranged clown with a bloodthirsty, spooky and creepy look. A successful representation of a humorous nightmare, innocent but deadly at the same time. A devil in a box that always plays on his horn, and who makes a transition from the imaginary world to reality. A real collection of curiosities with many incomprehensible creatures, interspersed with some ghoulish images and gory moments. The other characters were not exactly bad. Most looked really just frightened out of their eyes throughout the whole film. Katie Maguire played a persuasive role in which she has to put the two teenagers at ease and overcome her own fears at the same time. Many will think this is a very bad movie. Others will judge it as a sublime work. I’m right there in the middle. With the first two stories better developed, this wouldn’t have been a clownish display. Make sure you watch this movie completely, because the sting is in the tail.